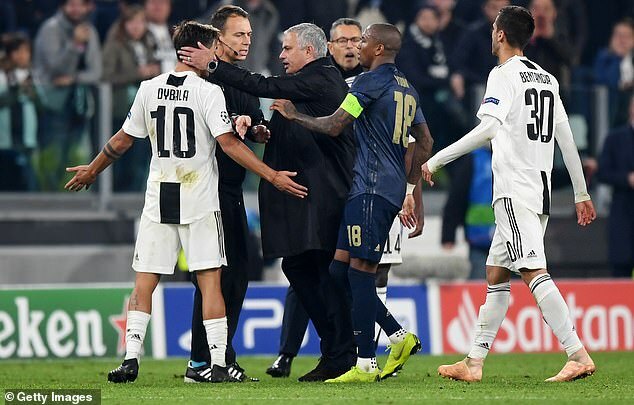 Paulo Dybala has revealed what he said to Jose Mourinho after the Manchester United manager taunted Juventus fans on Wednesday night. The former Inter Milan coach manager insisted he was responding to taunts from the Italian fans when he cupped his hands to his ears, bringing an angry response from Juve defender Leonardo Bonucci. Dybala, who scored against United at Old Trafford in Juve’s 1-0 win last month, also went over to speak to the United boss following his actions after the final whistle. Former United star Cristiano Ronaldo volleyed Juve ahead but United came back to hand the Italian champions their first defeat of the season with two late goals. Juan Mata scored an excellent free-kick in the 86th minute and Alex Sandro scored an own goal three minutes later. Juventus top Group H on nine points but United are just two points behind in second with two games remaining.